Binds documents up to 3" thick. An auto punch selector lets you choose between three different punching options: push button, automatic sensor, or foot pedal. Pressure bar firmly holds sheets for a compressed, professional bind. Automatically raises when binding is complete. Bind speed indicator adjusts bind speed to document thickness.. Integrated debind feature lets you add or delete pages effortlessly after the document is bound. Min Doc Size: Binds books as small as 8.5"
Max Doc Size: Binds books as large as 14"
Welcome to MyBinding video. Let's have a look at the VeloBind System Three Pro, an electric binding system by GBC. There's a few easy steps to a great looking book. First, use some scrap paper to make sure that the margins are set the way you want them. Press the button on the right hand side and it makes your punches. If all looks good, let's begin with the covers. Make sure the margin post is locked in place. Press the button and process through your entire document. This machine has a punch capacity of 22 sheets of 20lb paper per punch. Gather your pages together, it's time to bind. The System Three Pro has a bind capacity of up to three inches or 750 sheets. With the VeloBind binding strips, make sure the textured sides are always facing away from the document. With the flat part of the bind system, slide it into the groove in the back of the machine, assuring that the little pin goes through the little whole. Then place your product face up and put the male end of the VeloBind strips right down into the holes. On the control panel, be sure to select if it's greater or less than one inch in thickness and bring down the fence in the back. The machine takes over from there, hot knifing the needles right off, and lifts when it's ready. And you're all set with a great, unique-looking book. That's the VeloBind System Three Pro by GBC. For more demos, reviews, and how tos on this product and many more, check out MyBinding.com. Transcript: Binding books that are odd sized isn’t a problem with the System Three Pro. It will punch and bind documents as long as 14 inches or 35 centimetres, or as short as 8 inches or 20 centimetres. A slight adjustment of the binding edge guide for perfect paper alignment is all that is needed. Binding books that are odd sized isn’t a problem with the System Three Pro. It will punch and bind documents as long as 14 inches or 35 centimetres, or as short as 8 inches or 20 centimetres. A slight adjustment of the binding edge guide for perfect paper alignment is all that is needed. Documents with a large number of pages are a snap too. 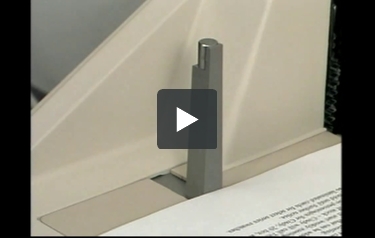 This system can bind documents up to 750 sheets thick with one simple motion. No other binding style offers the ability to bind up to 3 inches or 7.5 centimetres in a single book. Transcript: The System Three Pro is designed to stand up to years of use. GBC uses quality components, like die-cast aluminium cooling elements, pressure bars and strip supports. The Teflon coated cutting blades are made from steel that is designed to withstand high temperatures; and the punch motor delivers 300-ish pounds of torque to the harden steel punch-pins. The System Three Pro is designed to stand up to years of use. GBC uses quality components, like die-cast aluminium cooling elements, pressure bars and strip supports. The Teflon coated cutting blades are made from steel that is designed to withstand high temperatures; and the punch motor delivers 300-ish pounds of torque to the harden steel punch-pins. In the unlikely event that a problem does occur, you can count on GBC’s network of highly trained technicians to get your system back up and running. 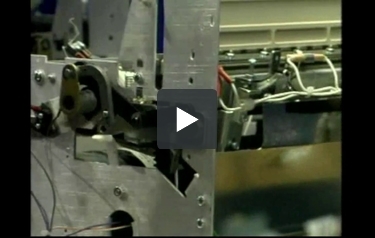 General Binding Corporation – hereinafter referred to as GBC – makes some of the best binding machines you can buy, whether you need a plastic comb, wire, or Velobind device. One of their many products is the Velobind System Three Pro, a machine that’s great for heavy-duty use. Read on to discover what you need to know about it. The System Three has one of the best binding capacities a Velobind machine have. It can bind documents that are up to 3 inches thick and contain a maximum of 750 pages. This makes this particular device ideal for binding very thick documents. This machine is compatible with GBC’s 11-pin, hot knife Velobind supplies. These particular supplies are available in the following three thicknesses (binding capacities): 1″ (250 pages), 2″ (500 pages) and, of course, the 3″ ones. You can choose from a variety of colors including basic black, navy blue, and green. 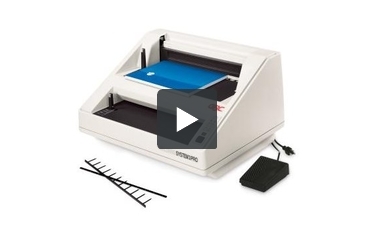 There are three different ways you can punch your documents with this device. It’s equipped with a foot pedal, a push button control, and an automatic sensor. Just choose the method that feels the most comfortable to you. You can be sure that your documents will be securely bound because the System Three has a pressure bar that clamps down on your pages during the binding process. When the process is complete, the bar will raise so you can remove your document. Speaking of the binding process, it won’t take very long for the machine to process your documents. It can bind a book that’s 1″ thick or less in just 8 seconds. Thicker documents will take 18 seconds which isn’t very long at all. One of the most unique features of this machine is its debinding function. It allows you to add pages to your document (or remove them) after it’s already been bound. This will give you a lot of flexibility as well as the chance to fix any mistakes you may find in your documents. This machine is on the large size and measures 22.5″ (length) x 13.5″ (width) x 18″ (depth). It’s also a bit heavy, weighing in at 60 pounds, so you should use a dolly or get a friend to help you if you ever need to use it. The GBC Velobind System Three is a pretty terrific binding machine that will give you professional results each time it’s used. This device’s binding capacity is one of the best available and it’s perfect for taking care of those lengthy documents. The debinding feature is a nice inclusion as well. While the punching capacity could be better, this machine is a great choice if you need a Velobind system for your workplace. Thank you for your question. I am sorry to hear you are having issues with your System 3 Pro. To address technical issues the best first step is to contact the manufacturers technical support department. The manufacturer is GBC and their phone number is 1.800.723.4000. If they are not able to assist, we are based out of Oregon, our service area is OR,WA, IL and southern CA. If you are in one of those areas contact us and we can set up a service call. If you are not in our service area we would refer you to a 3rd party nation wide service provider Serv Right, their phone # is 1-800-642-6015. Please let us know if you have any other questions or concerns.